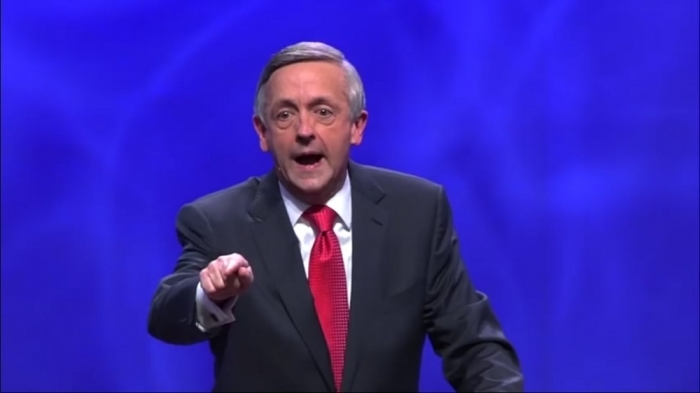 Pastor Robert Jeffress of First Baptist Church in Dallas has condemned what he called "bogus ministers" who have riled against police, arguing that officers are "called by God" in their careers. Jeffress spoke on "Fox and Friends Weekend" about the murder of five officers in Dallas by a man who said he "wanted to kill white peple, especially white police officers" allegedly in response to police-involved shootings, saying the vast majority of officers in America are good people. "The New Testament says in Romans 13:4 that law enforcement officers are ministers of God sent by God to punish evildoers," Jeffress said. "When you think about it, police officers are just as called by God to do what they do as pastors and priests were called by God. "I'm getting very sick and tired of so-called ministers who do nothing but sow seeds of distrust and disrespect for the police," he added. "Those kind of bogus ministers need to be exposed and need to be called out for what they're doing." Several pastors, including Steven Furtick, founder of Elevation Church based in Charlotte, North Carolina, have spoken out about how crushed they have been left by the shooting deaths of two black men last week, Alton Sterling, 37, and Philando Castile, 32. "I'm just saddened by it and wanted to reach out to you and also share with you that the Bible says we mourn with those who mourn and just having a pastor's heart," Furtick said in a video. "Not only is it heartbreaking to me but continues to stir me to action that we've got to proactively pursue healing for these issues in our nation," he added. "There's not a lot you can say is there? That's right, there are no logical answers. A lot of anger that I felt personally, I know you do as well." Jeffress said that he believes presumptive Republican presidential nominee Donald Trump will have a much better chance to unify the country under his leadership, but called on Republicans, Democrats and Independents to come together in prayer and healing as a response to the racial tensions gripping America. "It's time for us to be celebrating police officers, not condemning them," Jeffress repeated. Black ministers are divided in their support for Trump, as a group of 100 pastors and activists wrote an open letter to other African-American ministers who had agreed to meet with Trump last month. "Trump's racially inaccurate, insensitive and incendiary rhetoric should give those charged with the care of the spirits and souls of black people great pause. As people of God, you are surely aware of the emotional, spiritual, and physical toll continued structural and state violence takes on black people," the pastors wrote at the time. "Being continually reminded of reckless police disregard for black life through the circulation of videos that show them murdering our young people, like 12-year-old Tamir Rice, 7-year-old Aiyana Stanley Jones, and 17-year-old Laquan McDonald are both heart-breaking and stress-inducing," they added. The five police officers who were killed last Thursday are: Brent Thompson, 43; Patrick Zamarripa, 32; Michael Krol, 40; Lorne Ahrens, 48; Michael Smith, 55.